Men's Claddagh Titanium Ring : LOVE2HAVE in the UK! 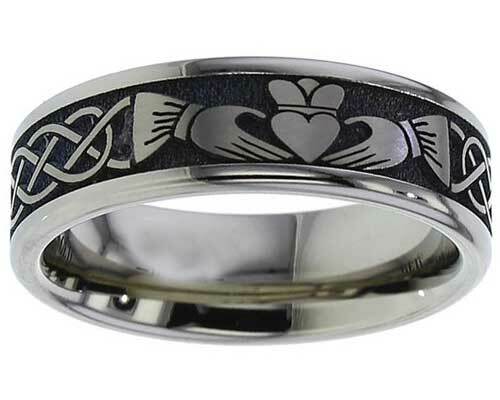 A 7mm wide, flat profile, men's Claddagh ring with an external laser engraved, Claddagh design symbol. The designer has given the traditional Claddagh symbol a nice clean cut modern contemporary feel. The ring also features a Celtic knot design, again, it is quite bold in a design sense. Most people have heard of the Claddagh symbol, but just to clarify it represents love and friendship. Buying a Claddagh wedding ring for a man can be somewhat problematic when it comes to choosing a design that men like, but at Love2Have we think we have the answer when it comes to style with this titanium ring with a dark Claddagh laser engraving. These intricate Claddagh designs for our titanium rings take approximately one hour to carve. This ring is available in a satin or polished finish. Finish(es) Available: Polished or matt satin. Returns Policy: You may return this UK made Claddagh ring if it is not to your satisfaction as long as it is not engraved. Please see our terms and conditions.